Tip to tip this rare sword measures 75cms. The finely carved timber hilt is covered for the most part with super fine and raised silver work, excuted with the finest details. Where the blade meets the hilt, the octagonal forte is expertly carved steel approx 27mm wide showing fine chevrons and deep multi chanel fullering with what appears to be leaves opening outward as if growing a blade. The forte narrows to 20mm where it kicks up at what many would consider an unusual angle, though typical for this type of sword. A very rare, heavy and fearsome headhunters weapon of the highest quality. 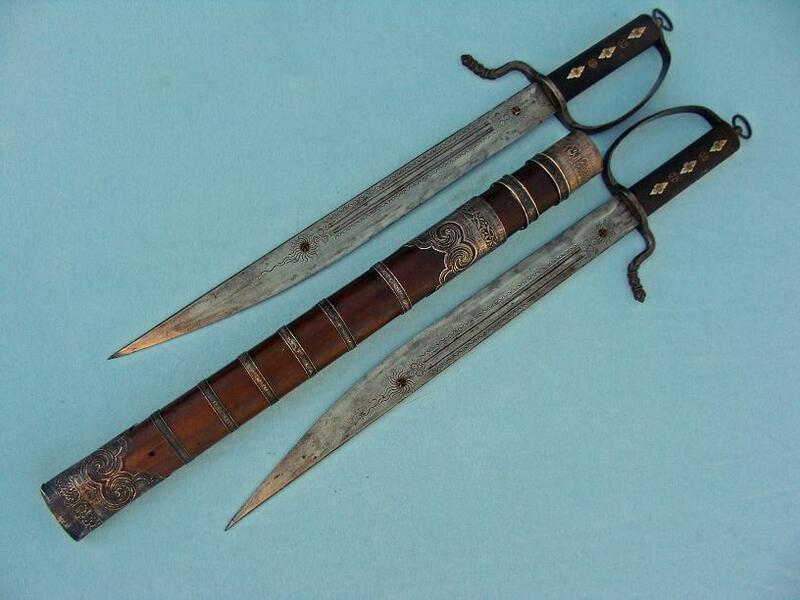 A very attractive Siamese Daarb, Darb, Dha, sword from the later period of the 18th century. This sturdy and formidable example offer the best of both worlds, that of a very attractive dress sword of rank and a very well balanced fighter of good length. Overall in the scabbard this example measures 93cms, out it is just under 90cms with a 52cm blade. The long silver repousse hilt remains in outstanding condition for its age. All detail is very clear and well made. The pommel has stood the test of time very well with only a very small depression to the end. The scabbard is most unusual in that it is of a copper alloy construction. In certain evening and candle lights the whole scabbard has a silver shimmer to it, most likely indicating a copper silver mix. The blade remains free from pitting and carries only light staining to its surface. The spine is a dome form all the way to the tip. The edge remains sharp and the blade shows a clear laminated pattern and clear blue highlights along the blade most likely the famous Namphee steel. 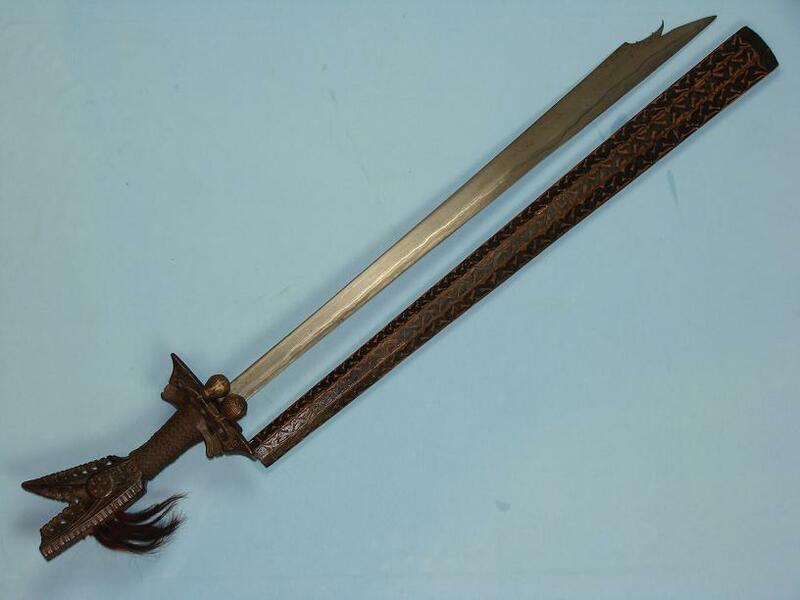 A very beautiful and rare Thai sword. 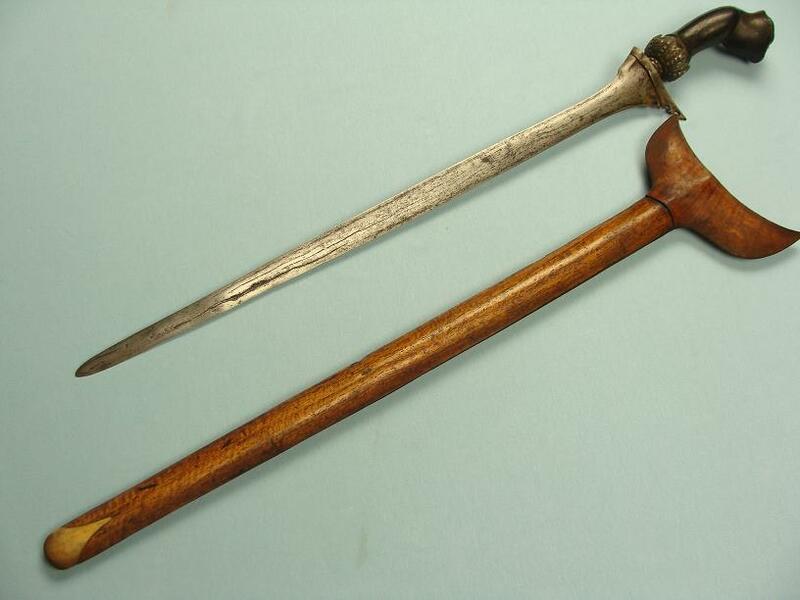 A unique pair of Hudiedao from French Indo-China. These fine fighting knives measure 56cms overall in the scabbard and are 49cms overall out of the scabbard. The blades sit separated in the scabbard by a timber divider. At close viewing of these knives, it is clear they have been made for an individual of great wealth or status. The timber and bone hilt slabs have been expertly carved and are pinned through the tang with brass pins that have been finished off with circle motifs. These pins not only help secure the slabs to the hilt but also hold 3 silver "menuki" style emblems and the hilt also has 2 Taoist coin inserts pierced to the outer wood slab between these. The knuckle guard is iron that has a lanyard ring to the base, flowers and vines to the outside of the guard and the quillon is filed and chiseled to the end and is what appears to be a stylized dragon. The tang apart from being pinned through the hilt, is also peened to the base and shaped expertly around the lanyard ring. The blades are needle pointed and razor sharp, double fullered to both sides and the fullers are surrounded by circle and half circle symbolism. The blades are fully pierced at both ends of the fullers and have Taoist coin symbols inserted into there piercings. The spines of both blades show expert filing patterns of almost every conceivable pattern and starts in a domed cross section and changes to a beveled cross section as it approaches the tip. A very light and dangerous pair of knives, being of superb quality, not typical by Hudiedao standards at all. A stunning sword from Bhutan with repousse silver fittings. This fine example measures 83cms long in its scabbard, approx 80cms out with a blade length just under 68cms. The silver work on this example is very striking and extremely well executed on all surfaces. To the front panels of the scabbard's fittings there are two five clawed dragons, one on each fitting. The dragons are seen writhing through broken clouds and are surrounded with checkered and floral borders. The reverse of these fittings show mountains, clouds and auspicious symbols. The hilt again shows important Bhutanese symbology and key relief patterning. The blade is a thick heavy fighting type with a prominent hairpin pattern. To the hilt is attached a very old fabric auspicious endless knot. A very rare sword. With the bearing of five clawed dragons and many important auspicious symbols, is mostly likely unique and made for a person of high importance. 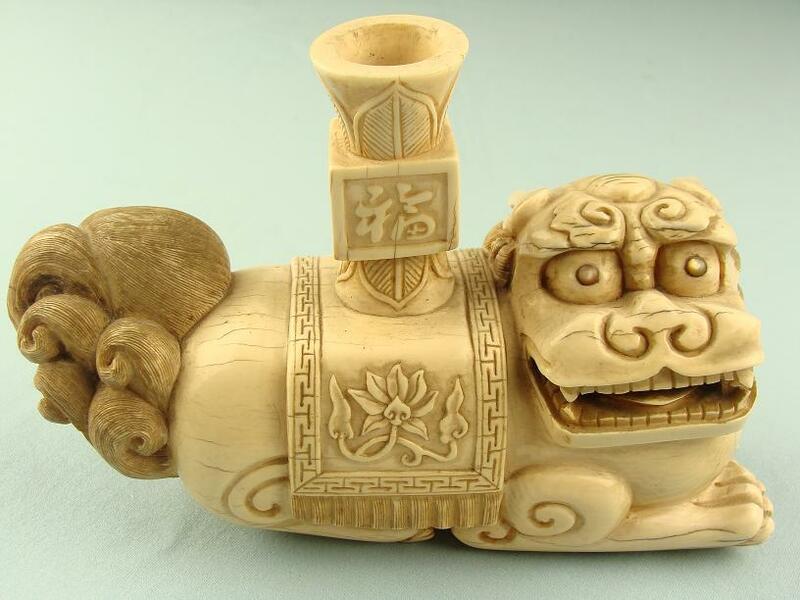 This stunning ivory carving is the work of an expert craftsman. Atop of the Lion is a blanket or mat with a key pattern border and what appears to be a lotus flower to each side. The applied/inlayed eyes appear to be moon stones or similar, possibly dark pearls. The censor was most likely one of a mirrored pair when first made and has long since lost its mate. Loosely translated the four characters surrounding the censor spout read heath, wealth, happiness and fortune. Bearing the mark of the Qianlong reign, this superb piece remains free from damages and losses. 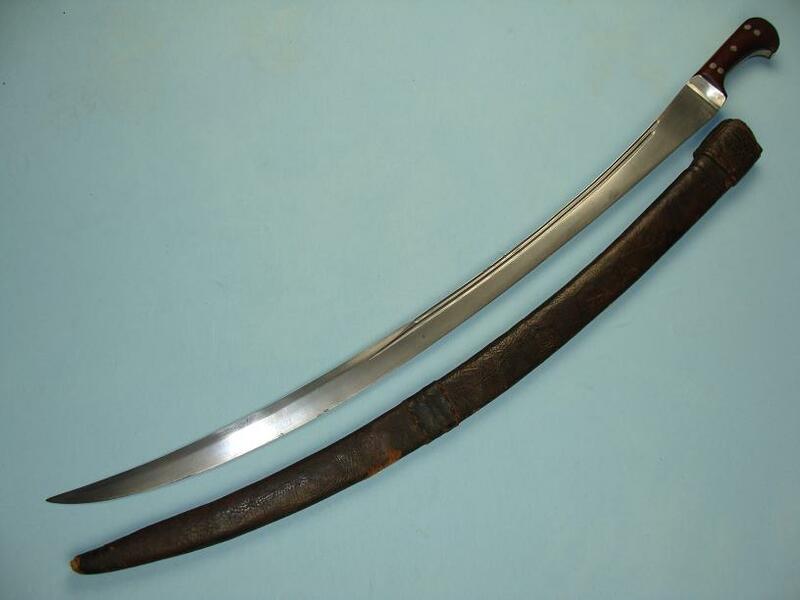 A fine and rare Bukharan Sabre with a stunning pattern welded blade of unusual form. 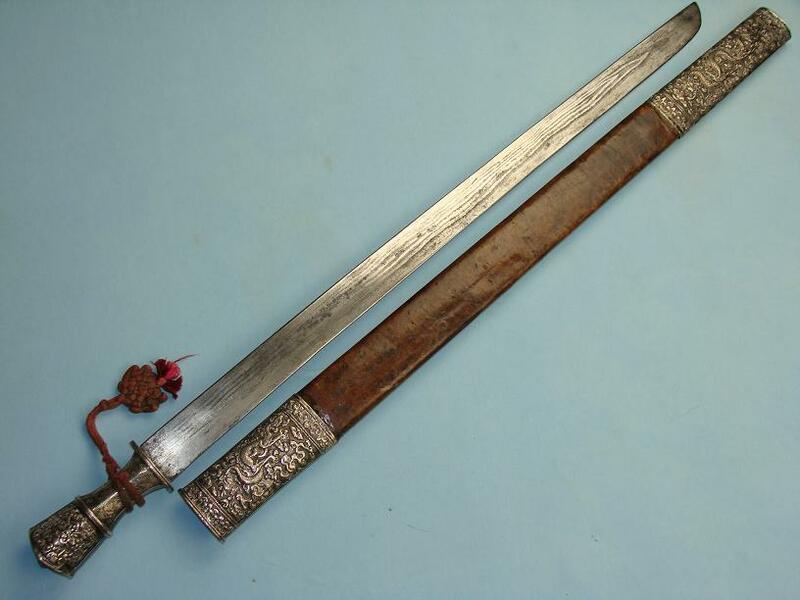 This extemely rare sabre is from Uzbekistan and is historically noted as being of pure Bukharan manufacture with very few examples known for comparative study. This sabre is just under 91cms long in the scabbard and is just over 89cms out with a 77cm blade. The blade characteristics of this sabre are rather unusual, having a slightly raised yelman with a beveled edges for exactly half of the blades length. The blade shows a very well controlled pattern welding design to the surfaces. The hilt slabs are of burl timber with silver grip straps and large silver rivets. The full tang construction can be noted where it slightly protrudes between the eared pommel. The scabbard is very basic in nature. the timbers are shaped at the throat to slightly house the grip slabs. The leather is thick, shows wear and is stitched in a basic manner to the rear. A very fine and rare pair of late 19th century Central Asian Pichoq, Bukhara. The small an important knives are of a style rarely seen being two knives joined to appear as one. 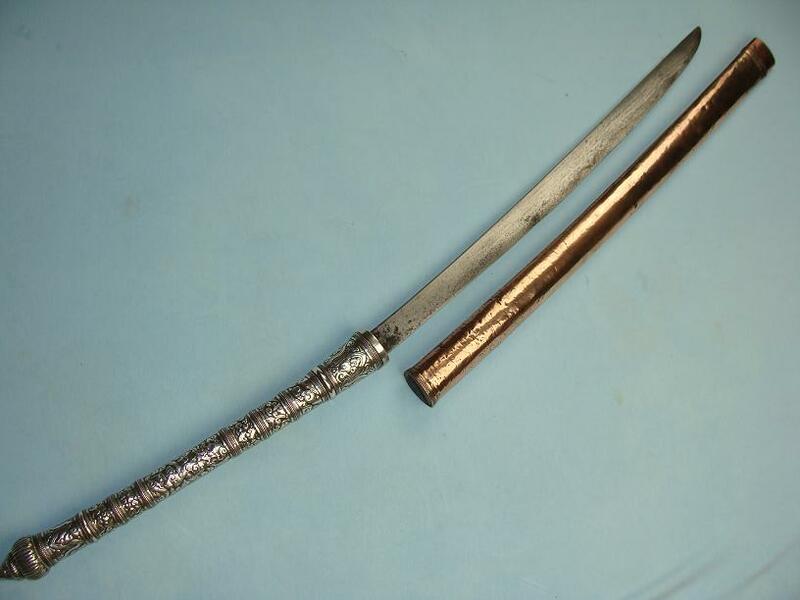 Similar method of twin knives is also rarely seen in Caucasian and West Indian weaponry and perhaps known to other regions too. The knives are mirror images of each other and as seen by the images, connected behind the hilts and released in a sliding manner. In the leather sheath they are 30cms long. Out of the sheath they are 25cms long with blade 14.5cms long. The decorative nature of the bolsters and the overall profile are indicative of Bukharan Manufacture. The script however does not appear to be native to the region and is perhaps Armenian influenced. As the method of marriage is known in Georgian Kindjhal seen in the Hermitage Museum and that Armenian or Georgian cutlers were known of in Bukhara is is very possible to be of their hands. 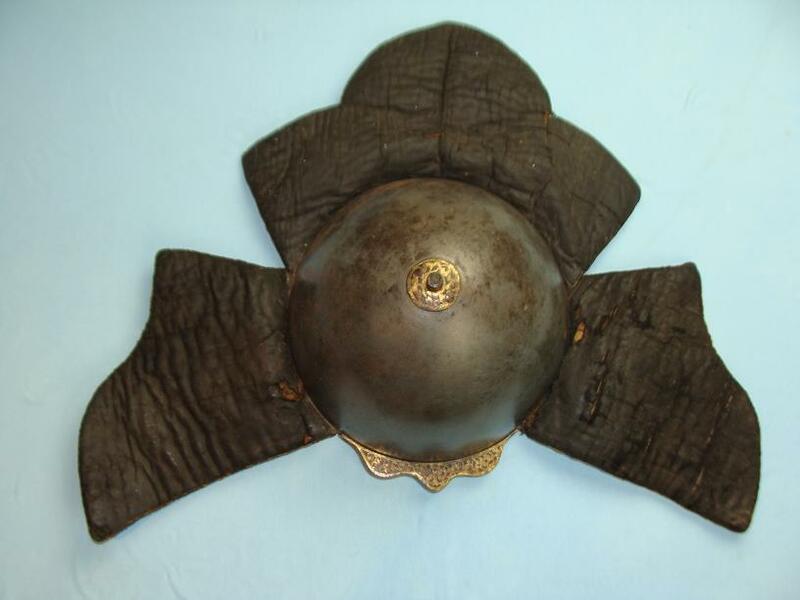 The blades tangs and grips are very finely decorated to all surfaces but the outer edge of the pommel. The blades are a finely pattern welded type with fine clear longitudinal laminations on the blade faces. A very fine, rare and important piece of Central Asian heritage. Dated to the 1870s, script not fully translated. An unique example of a massive Moro Kampilan of high status, attributed to the late US general of Armies, J.J.Pershing. Measured out of the finely carved scabbard this piece is 116cms long with a very nicely laminated and inlayed blade of 87cms blade. This overall length places this piece at approx 20cms longer than the typical known Kampilan. The massive and superbly carved hilt and guard remain in outstanding condition, workmanship that can be most appreciated in the viewing of the images rather than written descriptions. 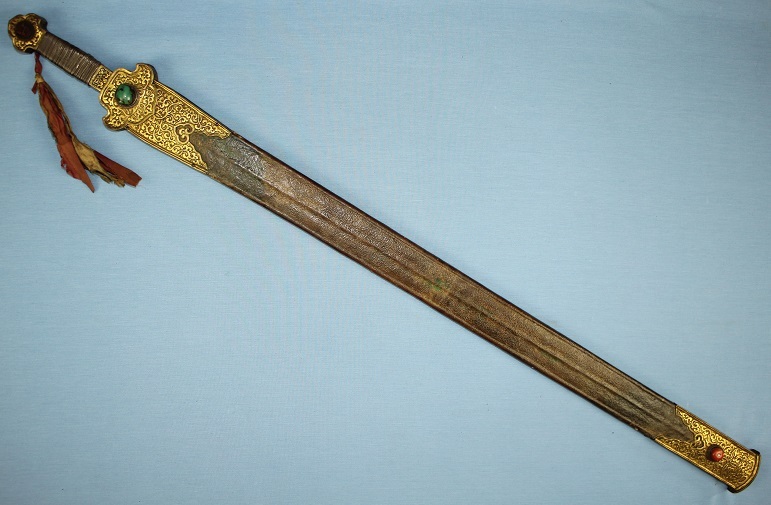 Page 57 & 58 of Robert Cato's work "Moro Swords" describes at length the Kampilan scabbard, ranging from the plain pedestrian style mostly seen through to the scabbards of nobility that show decorative sectioning, are "rectangular" in profile that are magnificent coverings that have been artistically decorated with intricate okir carvings throughout as is clearly the case here. Currently being updated to include supporting data about the inaccuracy of details seen on the collection tag of this Pershing Kampilan through the direction and information provided by Mr Bob Fulton. It is through this information provided and foot work done by Mr Jeff Pringle that it is very highly propable that this Kampilan is that of one of the three or four Datu's who lost their lives at the battles of Bayan & Pandapatan cotta (1902) and likely as mentioned on the tag, that is was from the Pandapatan Datu himself and was part of the Pershing collection. An important collection of Aceh weaponry from Kelling Hall. These wonderful old weapon boards have come from the trophy room/sitting room of Kelling Hall. 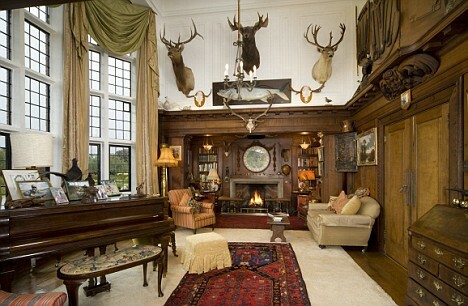 Two of the three boards can be seen in the upper right hand corner of the sitting room image. Further detail of all three boards seen in the images below. I will be releasing 9 of the 30 items for sale. All weapons that are sold from these boards will come with a photograph of the sitting room and a photo of the board the item comes from, along with a short history outlining their important historical provenance. 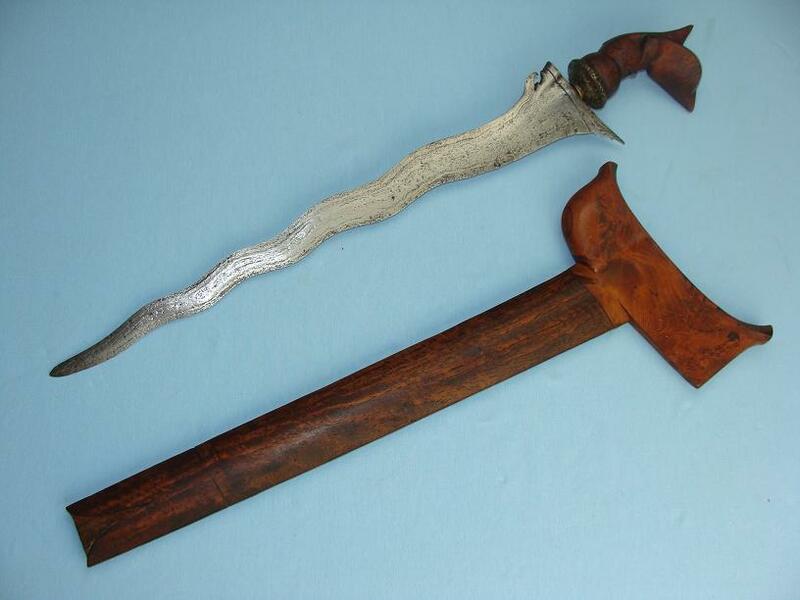 Keris, Jawa Demam hilt, Sumatra, Kelling Hall collection. A very fine Keris with only a small loss of the bone tip that once was to the base of the scabbard. In original untouched condition, this Keris measures 47cms and no doubt would have been closer to 50cms with a bone tip present. 45cms out of the scabbard with a 36cms blade in outstanding condition. The blade shows well executed patterns and sports a razor sharp edge. The Jawa Demam hilt and the scabbard all show beautiful grains within the timber and remian in fantastic condition. Overall an outstanding untouched Keris that had been sitting silently within Kelling Hall for near 100 years. Keris Panjang, Kelling Hall collection. A beautiful and untouched Keris that has sat silently on the walls of Kelling Hall for approx 100 years. 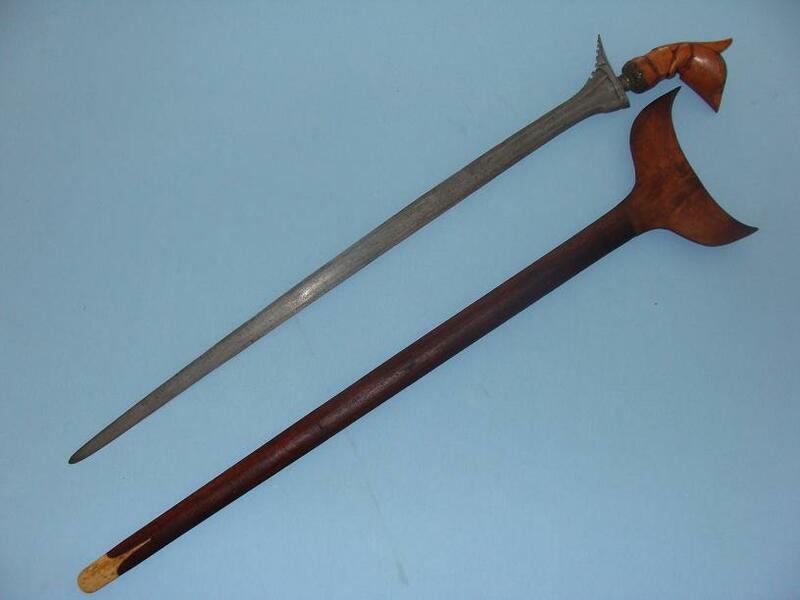 Commonly referred to as an executuion Keris, these Keris were both for fighting and execution when called upon. Overall in the sheath the piece measures 73cms, out it is just under 69cms with a long razor sharp blade of 58cms. The blade is finely crafted and shows wonderful forging lines to the length of both sides. Both the Jawa Demam hilt and the scabbard display a nice wood grain, burl in places and the scabbard is finished with a bone insert to the tip, though it may also be ivory. A nice complete and untouched example of a long Sumatran Keris. 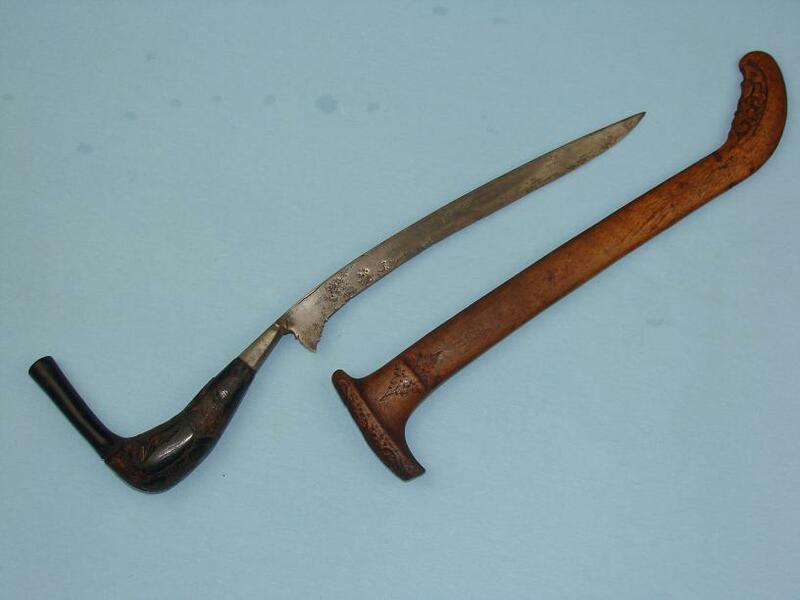 A very rare example of a Rencong with an Akar Bahar Hulu Meucangge hilt, being a nice old and unusual Rencong variant, Northern Sumatra, Kelling Hall collection. Measuring just over 43cms in the scabbard, just under 35cms out with a blade length excluding the bolster/stem ring of 23cms. The blade is slender with a downward curve, it is little over 7mm thick in front of the stem ring and is approx 13mm at the hilt. The blade shows a single long scarf weld to one side being along the spines edge. The Hulu meucangge hilt is of black coral known as Akar Bahar. The coral shows beautiful natural fire reds throughout. Where the natural stems have been removed to obtain the hilt shape, the lower part gives the impression of two large black eyes looking out from the hilt. The scabbard throat remains full and intact and shows nice old carved decorations. The scabbard shows small ink decoration to three places on one side and a single design to the reverse. 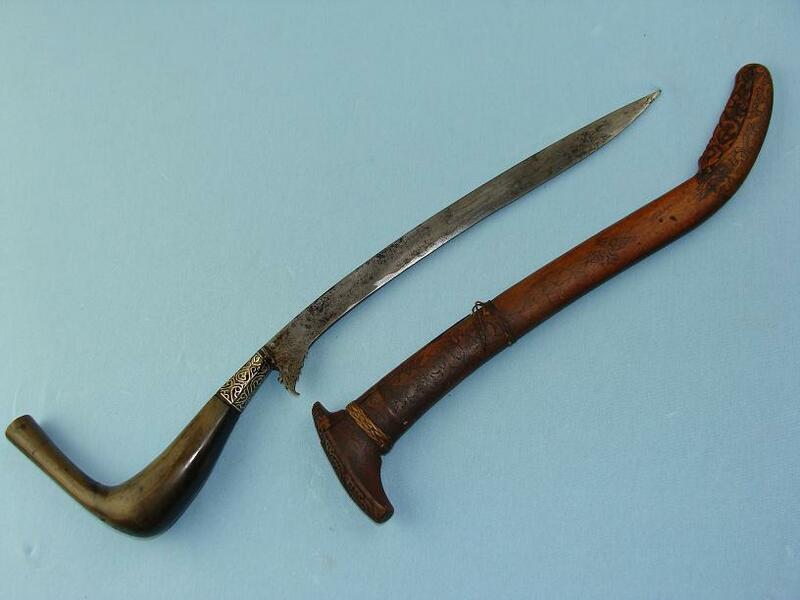 A very rare and fine example of an old Akar Bahar hilted Rencong. This fine untouched example is from the Kelling Hall collection. The overall length of this Keris in the sheath is just under 58cms, out it is just over 53cms with a finely crafted blade of 43cms. The blade shows beautiful forging lines. It swells towards the middle and tapers to the tip. The mendak appears to be of pewter and is well cast. The hilt is carved timber showing a beautiful warm glossy patina. The sheath also shows a wonderful warm old glossy patina and is finished with a bone tip. A beautiful and fine, untouched Keris example, something seldom seen. 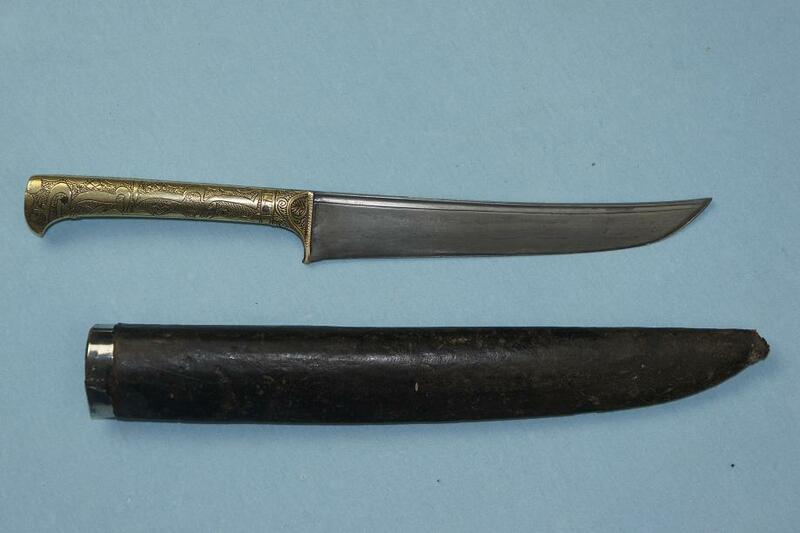 A stunning and extremely rare knife from Northern Sumatra, Kelling Hall Collection. A very rare status knife called a Peurawot. 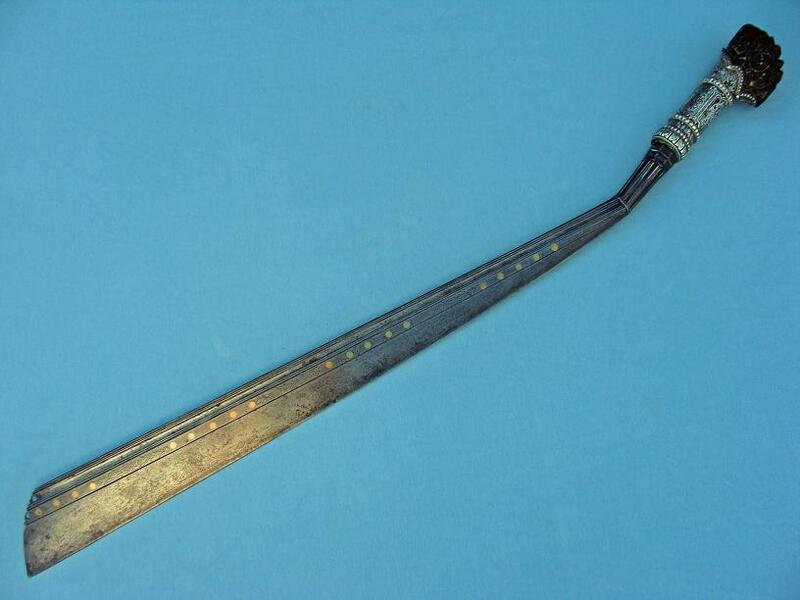 Traditionally these knife types were used to ceremonially to cut Betel nut and distinguish the owner of such a knife.This example measures 35cms long in its sheath, 32csm out and has a blade length of 21cms. 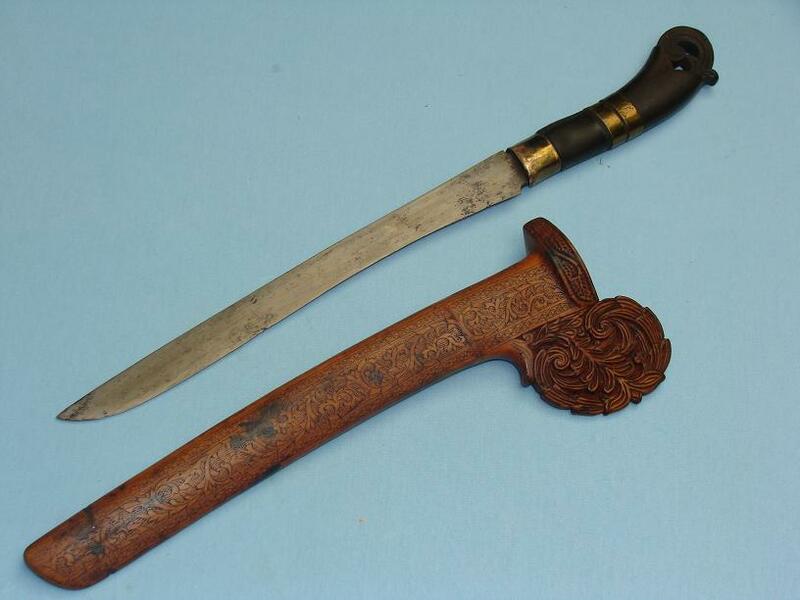 The knife's hilt is of carved horn in Hulu Puntung style with the narrowed and open worked pommel. The grip and fore grip and bound with three simple Suasa collars. The blade is of a simple forward curving, single edged form with a narrowing waist. With the spine being 7.5mm thick at the base, the Peurawot carries some weight to it. The sheath type is an exceptional example throughout, from the ergonomics of the form when held with the thumb and forefinger, to the finest Sumatran carving within the bellowing floral motifs and superbly incised ink work to its surfaces. What sets this example apart from most is it sheath, in that the large carved roundel is very rarely seen. A very fine and rare knife with impeccable provenance.